The Old West is still alive and shooting at Durham Ferry (MSI is located adjacent to the historic gold boom era Durham Ferry). 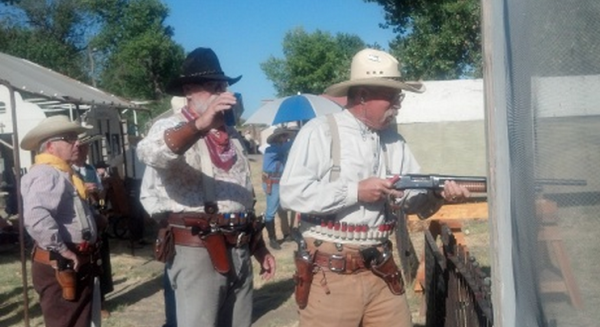 Two Rivers Posse, the MSI cowboy action shooting group, resurrects the spirit of the Wild West on the first Saturday and the fourth Sunday of every month. These competitions are called “Shoots” and are gatherings of like minded people for fun and fellowship as well as shooting events. Two Rivers Posse is an affiliate of the Single Action Shooting Society (SASS) which is the international organization that provides regulation and organization for the hundreds of SASS clubs and nearly 70,000 members from all over the world. The focus is on being safe, having fun and being safe. A cowboy can shoot at Durham Ferry, Westhampton, New York or Gladstone, New Zealand and the guns, outfitting, and rules will be just like the ones at home. Cowboy Action Shooting is a fantasy game and multifaceted amateur shooting sport. Contestants compete with firearms typical of those used in the taming of the Old West: single action revolvers, lever action rifles, and side by side double barreled, pre-1899 pump or lever action shotguns or faithful reproductions of those guns. 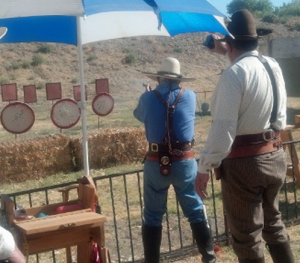 The shooting competition is staged in a unique, characterized, “Old West” style. Contestants shoot in multiple stages (courses of fire) in which they engage reactive steel silhouette targets. Scoring is based on speed (a timing device) and accuracy (time added for misses and procedural errors). The ideal is a bang followed by a clang. Every shooter hopes for that to happen. Some just make it happen a lot faster than others. The truly unique aspect of the game is the premium placed on authentic period or western screen costumes. 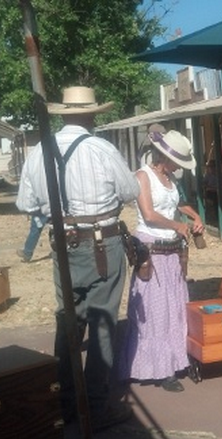 Each participant is required to adopt a shooting alias appropriate to a character or profession of the late 19th century, or a Hollywood western star, and develop a costume accordingly. In the tradition of the Old West cattle brand registries, SASS prohibits one shooter duplicating another’s alias. There is only one Tex, one Shenandoah and one Loophole Pettifogger. SASS maintains an alias registry and assures that your alias is uniquely yours. American history buffs and serious shooters alike agree that the use of vintage firearms, authentic costumes, unique targets and fast action make Cowboy Action Shooting one of the most interesting of all shooting sports for both spectator and contestant.